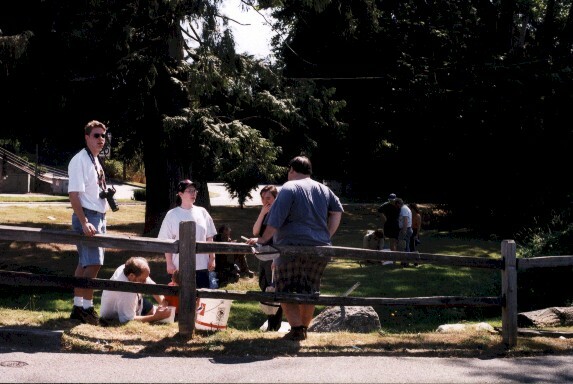 The 1998 Pacific Northwest NANFA Region's annual meeting was held in Poulsbo, Washington on August 8-9, 1998. 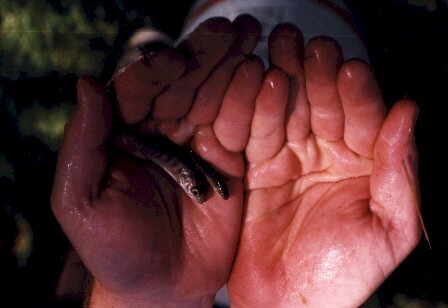 For our fish collecting activities, our guide Paul Dorn took us to four sites on Dogfish Creek. This creek flows into Liberty Bay in downtown Poulsbo, located on the Kitsap Peninsula west across Puget Sound from Seattle. Nearly the entire creek flows through developed land. 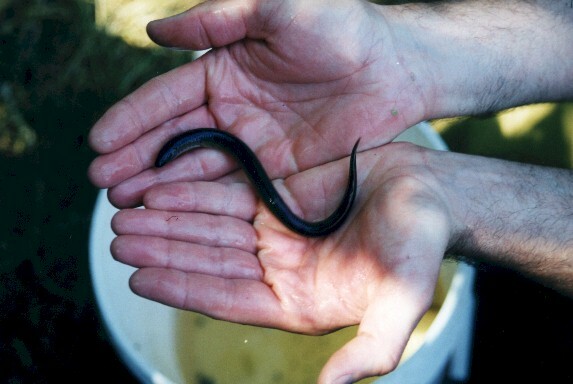 We sampled fish populations, learned about salmon biology and life history, effects of development on habitat and fish populations, and planned stream-cleaning and bank-revegetation activities to improve the habitat of Dogfish Creek. 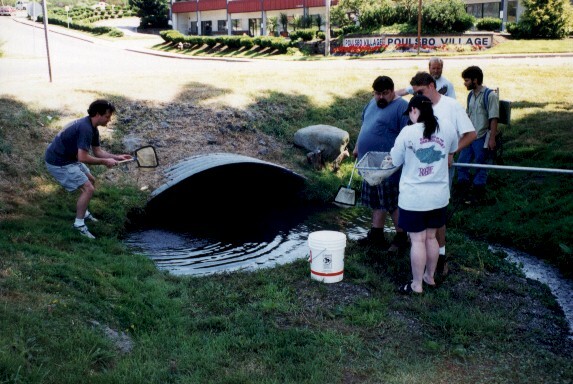 These activities were planned and supervised by Paul, who is a professional salmon biologist, and conducted in part to aid in the Suquamish Indian Tribe's biological assessment of East Kitsap County streams. We thank Paul for taking the time to share his expertise, and we thank him for generously opening his home to us. He provided us all with a weeked we'll not forget. 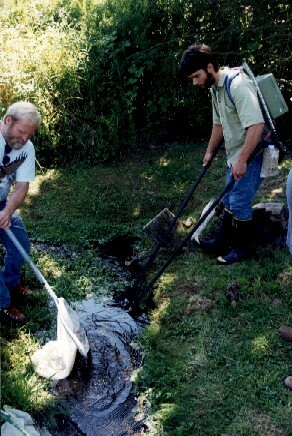 Paul Dorn and Dave Lains electroshocking the small stream, which here flows through the backyard of an elderly local resident. Notice how the yard is mowed right to the stream bank. In addition, the owner uses fertilizer on her grass. 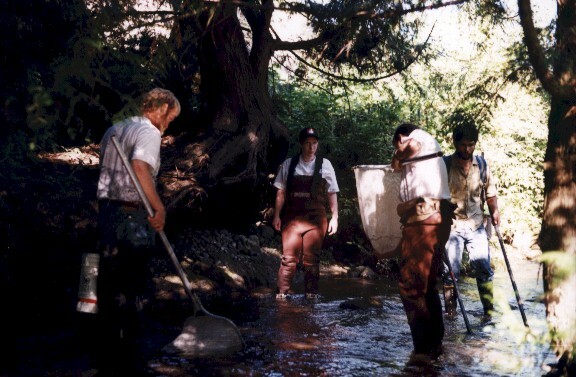 We invited her to see the fish we found, and mentioned that fertilizers and pesticides applied to the grass were likely to find their way into the creek. She was surprised that there were so many fish in the small creek. Hopefully she'll develop a sense of "ownership". 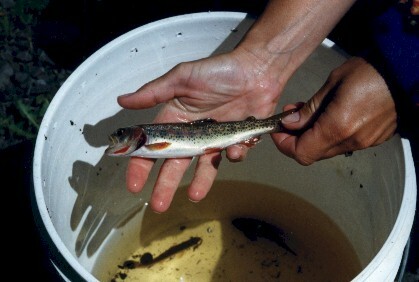 Small cutthroat trout were all we found but there were lots of them. Site 2 - Dogfish Creek at a site where it passes under a road between a shopping center and a city park. This hole held an adult Western brook lamprey and a juvenile (known as an ammocoete), plus some more juvenile cutthroat trout. This section was carved out by a back hoe, and the culvert was new. Jay DeLong, Norm Edelen, Amy Leudtke, Layn Leudke, Paul Dorn and Dave Lains are pictured. Left to right, foreground: Layne Leudtke, Mike and Thomas Messenger on the ground, Amy Leudtke, homeless guy under the tree, Lisa Hayashi and Norm Edelen. Left to right, background: Dave Lains, Jeff Kruse, Paul Dorn and Katrina Kruse. Paul Dorn, Amy Leudtke, Layn Leudtke and Dave Lains fishing this thickly vegetated shaded section. There were not many fine substrate particles like sand and mud here-- mostly gravel, cobble and boulders. The water was clean and cold. Site 4 - Near the mouth of the creek. 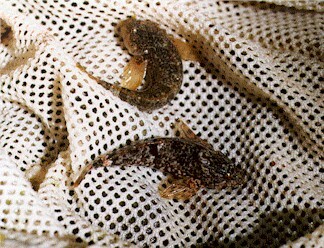 There was more current here and we found three sculpin species-- torrent sculpin, coastrange sculpin and prickly sculpin. Father and son Michael and Thomas Messenger looking at sculpins in a bucket. We were all infected with 3-year-old Thomas' enthusiasm.